This bedside wall light with switched LED reading light and white shade in satin silver finish is contemporary and features a square angular profile. 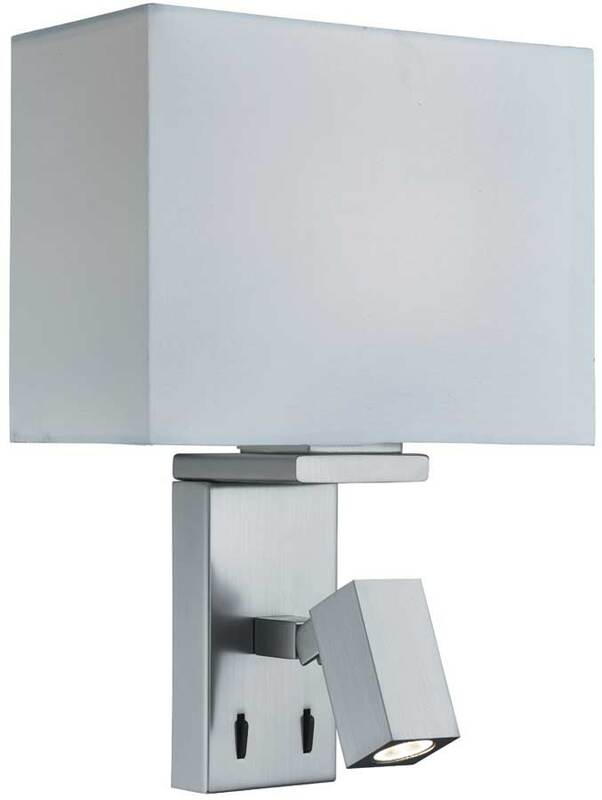 Tall rectangular wall mount fitted with two rocker switches and flat section arm, with directional spot light and rectangular white fabric box shade. The two switches enable the wall light and reading light to be used together or either one independently. A stylish, practical design that would suit any living room or bedroom wall. 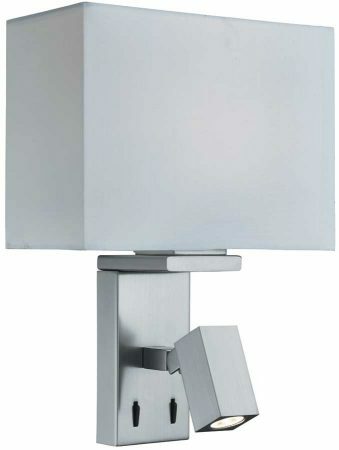 The double switched wall light features a satin silver finish wall plate and can be used as a standard wall light with the rectangular white shade. It also has a discreet adjustable lamp head projecting from the plate using the latest energy saving LED technology, which is ideal for use as a reading light. The top part of the light is capable of accepting a traditional or LED lamp bulb and the lower light is supplied fitted with a 2w warm white LED lamp. Both lights are independently rocker switched making it a great choice for mounting next to the bed or on a wall next to your favourite armchair. Supplied by Searchlight Lighting who manufacture some of the best traditional and modern classic designs such as the bedside wall light with switched LED reading light and white shade in satin silver finish you see here.